Over the last half century, the Castro-led Cuban government’s relationship with the émigré community, while antagonistic, has included accommodating interludes as Havana has sought to take advantage of or drive wedges within the various components of the latter. The deep polarization that accompanied the early years of the revolution, the intransigence of policies anathema to would-be emigrants, and the iron fist with which radical policies were implemented, produced profound and lasting cleavages between the early exiles and Cuba’s ruling political elite. With time, as the regime’s hold on power was consolidated and the nature of the emigration flow evolved, Havana and segments of the émigré community began making reciprocal overtures to soften some of the most acrimonious elements of the relationship. Motivated primarily by humanitarian and family concerns, the more accommodating émigrés acted based on their assumption of the irreversibility of the revolutionary process. As most other émigrés, they were deeply rooted in the United States—and other countries—and were primarily motivated by a desire to maintain contact with or reconnect with their families in Cuba. For more recalcitrant émigrés, notwithstanding family concerns, compromising with the regime was tantamount to betrayal, although they were willing to accept limited measures to minimize hardships of relatives and regime opponents still in the country. With the passing of time, as economic motivations began to overshadow political dissent as a driver of emigration, family and cultural ties were strengthened with the continued arrival of new emigrant cohorts. While equally disenchanted with Cuba’s situation, most recent emigrants are generally averse to involvement in political activities. Their preoccupation is centered in the pursuit of economic opportunity. The regime, facing continued domestic problems—and as means to deal with them— historically has actively encouraged permanent emigration of disaffected Cubans. Abruptly at times (e.g., Camarioca, Mariel, the 1994 Balsero crisis), systematically at others (e.g., the negotiations leading to the “Freedom Flights, the post-Balsero Cuba-U.S. Migration Accord), Havana has brazenly relied on the emigration safety valve to promote political stability. Facing the collapse of its Soviet Union patron and confronting a severe economic crisis in the early 1990s, the regime decided to take financial advantage of the once-shunned émigré community. Encouraging family visits was but one way to kindle remittances flows. The strategy came to full fruition with the 1994 U.S.-Cuba Migration Accord, which resulted in the largest emigration outflow since 1959, with corresponding increases in émigré remittances and return visit receipts. Cuban authorities capitalized on enhanced relations between the island and its citizens abroad by charging very high fees for consular services and other services to émigrés. With the relaxation by the Obama Administration of travel restrictions in 2009, émigré-related state revenues further rose to achieve historically high levels. Since the early 1990s, close to half-a-million Cubans have settled in the United States, with several thousand more travelling to other countries, particularly Spain. 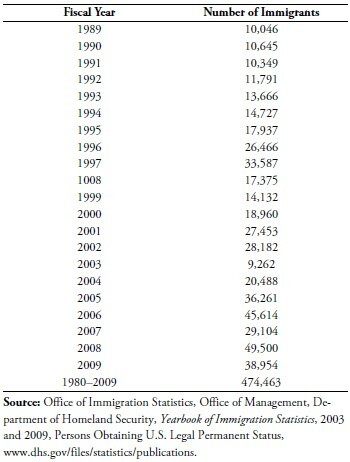 Table 1, drawn from official U.S. statistics, provides information on Cuban nationals admitted as permanent residents in the United States between 1989 and 2009. 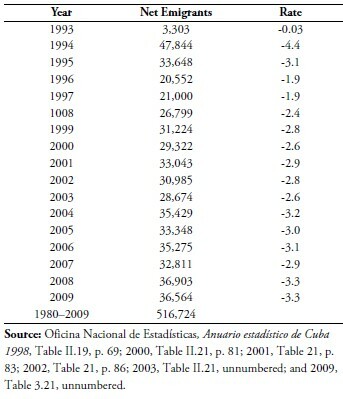 Table 2, in contrast, provides net emigration figures from the island between 1989 and 2009 according to Cuba’s official statistical institute. There is a close correspondence between both sets of figures: the higher number of emigrants depicted in Table 2 represent emigration to countries other than the United States. In 2007 alone, nearly 10,000 émigrés reached Spanish shores (Suárez 2008). The number of Cuban émigrés is expected to rise in years to come pursuant to the Ley de Nietos (Grandchildren Law), approved by the Spanish Parliament, which extends citizenship rights to foreign-born grandchildren of Spaniards. Estimates vary, but it is assumed that between 150,000 and 250,000 Cubans may be eligible to apply for and receive Spanish passports (“Cerca de 24,000” 2009; Vicent 2010a, 2010b). Many beneficiaries, and their families, are expected to eventually migrate to Spain. The migration flow to the United Sates continues unabated and it is likely to increase further as recent arrivals become naturalized citizens and take advantage of family reunification provisions in U.S. immigration law to bring additional family members. Smaller migration flows to other countries continue to be reported in the press. Marriages of convenience with visitors to Cuba or arranged with willing nationals by Cubans reaching other countries are frequently reported (Agence France Press 2010). Emigrants also take advantage of legal loopholes, as is reported to be the case in Ecuador when Quito, to encourage international tourism, eliminated visa entry requirements. As many as 50,000 Cubans are said to have taken advantage and entered the country since June 2008 (Solano 2010). Also contributing to the migrant hemorrhage are frequent defections by Cubans participating in internationalist missions around the world (for a review, see Díaz-Briquets 2006). The growing Cuban presence abroad has given rise to another émigré income-maximizing revenue source for the Cuban government. Contrary to the practice of most other countries, rather than reducing transaction costs to facilitate maintenance of transnational contacts between home country and emigrant communities, the Havana regime views the emigrant community as a cash cow. It shamelessly maximizes what it extracts from the emigrants, charging exorbitant fees for routine consular services. The regime in Cuba, likewise, levies considerable sums for emigration and foreign travel-related services that citizens of other nations seldom, if ever, have to pay to visit or settle in other countries, such as permits for return visits. Returning Cuban visitors abroad and Cuban residents visiting the country are forced to pay steep fees for exceeding arbitrarily-established limits on the importation of consumer goods, a practice unknown in most countries unless the imports are intended for commercial purposes. Moreover, a particularly onerous burden Cuban émigrés face when visiting Cuba or forwarding remittances to relatives and friends is the 10% fee that must be paid when converting US dollars into convertible Cuban pesos (CPs). The conversion fee is very high and is totally out of line with what visitors must pay when exchanging dollars into local currency when traveling elsewhere in the world. The conversion fee amounts to a discriminatory tax as it is only levied for conversion of U.S. dollars into CPs, a practice not associated with the exchange of any other national currency for CPs. Since most Cuban émigrés reside in the United States, the U.S. dollar/ CP exchange fee was specifically designed to increase the transaction costs of the émigré community with the homeland. Tables 3 and 4 provide information on the services provided by the Cuban Consulate in Washington and the fees for each. Table 3 brings together travel related services (e.g., passport renewals, consent decrees for minors to travel abroad) and the fees charged for each, whereas the second provides a list and fee schedule for other types of services (e.g., legalization of documents, certifications for the repatriation of human remains). As shown in Table 3, some travel-related fees run into the hundreds of dollars, the highest being for new passport requests and renewals. The Consulate also charges sizable fees for travel-related requirements unique to Cuba, such as $150 per month for residents of the country wishing to extend their temporary exit permits while visiting the United States. A unique Cuban requirement is the $136 charge for processing a “Letter of Invitation” when a U.S.-based person requests from Havana a temporary exit permit for a family member in Cuba to visit. Naturalized U.S. citizens of Cuban birth who departed the country prior to 1970 are not required to use a Cuban passport when visiting the island, as do all others, but must pay a $150 fee for the privilege. Other requirements, and the fee for each service, are shown in Table 3. Generally speaking, lower fees are levied in connection with official visits, repatriation procedures, or for travel related to “humanitarian” reasons. Table 4 provides non-travel related services and the fee schedule for such services. Some fees run into the hundreds of dollars, in particular those associated with the authentication of foreign birth, marriage and divorce certificates. Fees for two types of services are especially onerous. Requests for academic transcripts are usually honored, but petitioners must pay a $460 fee for each transcript, inclusive of a $180 charge for legalizing the document. Medical transcripts are currently not been issued by Cuban consulates, it has been reported, as a means to dissuade medical personnel from defecting while posted abroad in internationalist missions (Tamayo 2010). This policy is consistent with other punitive measures aimed at professionals who often seek to defect in these instances (Fernández 2008; Robles and Woods 2008). 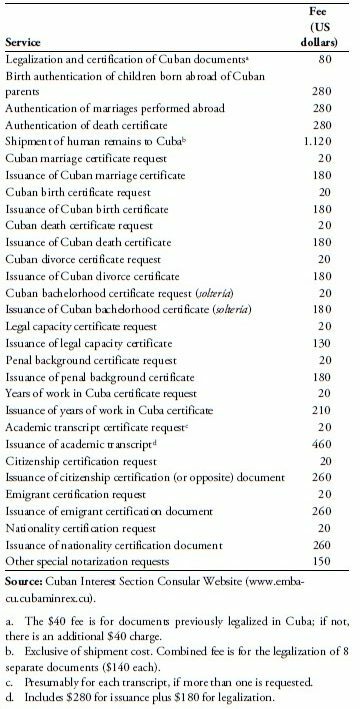 By far the highest fee is required for shipping human remains to Cuba, a total $1,120 for legalizing 8 separate certificates (at $140 each). These are a death certificate, a cremation or embalming certificate, a sanitary certificate, and a burial or transit certificate. Each document must be notarized and submitted to the Consulate in English and Spanish. The extent to which Cuban Consulate fees are out of line with those from other Latin American countries can be appreciated by comparing fee schedules for selected services offered by consulates from these countries in the United States. 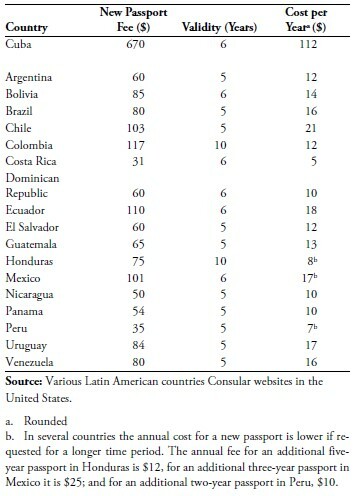 The fees gathered in this note are those listed in consulates’ web sites; they therefore may not reflect overcharges alleged to be levied, whether legally (supposedly to cover administrative costs) or illegally by some consulates in the United States as documented for Honduran consulates in Atlanta, Georgia and Dallas, Texas (“Cobros ilegales” 2010; “Piden al Nuevo” 2010). The number of comparisons that can be made is limited as the types of consular services offered vary significantly from country to country. Moreover, as a general rule, consulates of most Latin American countries do not offer many of the services offered by the Cuban Consulate. Coming from countries with more open and accessible political systems and standard border control procedures (e.g., nationals or emigrants are not required to apply for and receive exit or entry permits), these travelers do not have to seek the documentation services handled by the Cuban Consulate. Emigrants from these countries, furthermore, usually can obtain most legal documents directly or through the good auspices of relatives still in their countries. Comparative data for one of the services most often requested by émigré communities, the issuance or renewal of a passport, are shown in Table 5. At $670, the Cuban Consulate charges 6 to 20 times more than any other country in the table, with Costa Rica charging the least ($31) and Colombia the most ($117) outside of Cuba. On an annualized basis, the cost of a Cuban passport remains very steep, 5 to 22 times higher than in other countries in the region listed in Table 5. 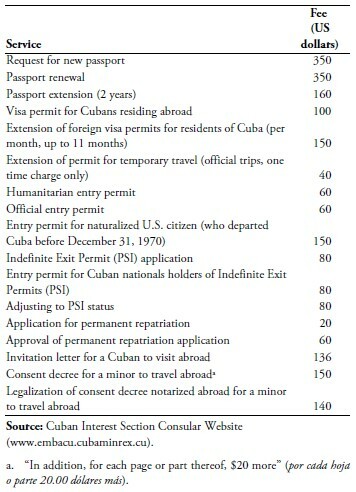 The extraordinarily high fee charged by the Cuban Consulate for obtaining or renewing a Cuban passport is a product of two separate fees: (1) a $350 payment considered an application fee; and (2) an additional $320 to maintain the passport’s validity for its six years duration, two two-year renewals being mandatory (at $160 each). Moreover, in order to visit Cuba, Cuban-origin naturalized U.S. citizens must travel on a Cuban passport (except, as noted, those who left Cuba before 1970), a requirement no other naturalized Latin American emigrant must satisfy. Comparative fee data are also available regarding consent decrees for minors to travel abroad, a universal requirement these days to prevent a disgruntled parent from taking a child overseas absent the other parent’s authorization. 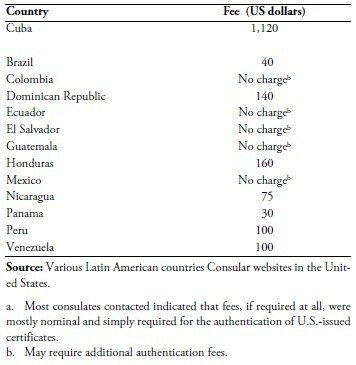 In this case, as shown in Table 6, Cuban consular fees are well above what is charged by other countries’ consulates, as much as 16 times higher than Bolivia’s. At least one country, Mexico, offers this service gratis as a service to its nationals residing overseas. 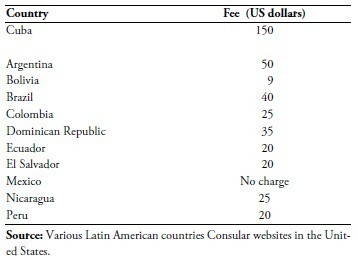 From a comparative perspective, by far the most excessive and onerous Cuban fee is the one charged for repatriation of human remains, as indicated in Table 7. In all cases, consular fees for repatriation of remains are exclusive of actual transportation costs, which are a function of distance and other factors. In absolute terms, the Cuban Consulate charges nearly $1,000 more than the other two countries levying the next highest fees, the Dominican Republic and Honduras. For humanitarian reasons, most other countries only either collect a nominal fee, or no fee at all. Not even in death are Cuban emigrants capable of escaping the confiscatory hand of the regime. While it is difficult to estimate how much revenue accrues to Cuba from the consular fees levied for travel and other purposes, it is clear that the amount is significant. With close to 300,000 Cuban-Americans visiting Cuba in 2009 (“Casi 300,000” 2010), with an even higher number expected in 2010, the figure must approximate $30 million a year just from the issuance of passports. The estimate assumes onethird of visitors, out of a pool of roughly one million post 1970 U.S.-based Cuban emigrants, renew their passports and request extensions each year. Somewhat less must be the amount of fees collected for processing exit visas (150 CPs for a Carta Blanca) paid in Havana (Pérez Pulido 2008), or for permits for visits by relatives of Cuban-origin families in the United States paid to the Consulate. 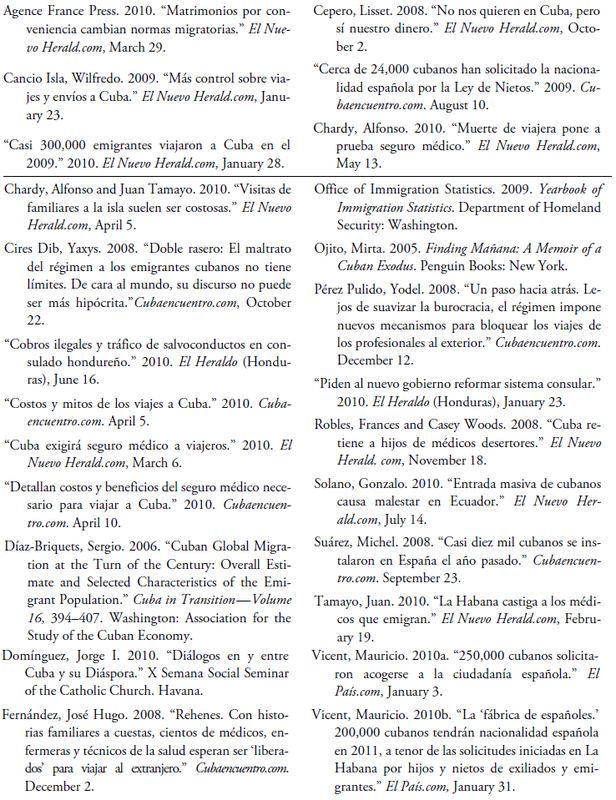 In 2009 for the Carta Blanca item alone, Cuban-Americans must have paid $8 million (in CPs) assuming the 36,564 Cuba emigrants reported in the 2009 Anuario Estadístico paid the fee the same year they left the country. With fees charged for processing foreign visit exit permits and extension requests for the reported 17,047 non-immigrant Cubans who visited the United States in 2009 (Office of Immigration Statistics 2009), plus consular fees for many other types of services, revenues begin to add up. Always looking for further ways to increase revenues collected from its natives abroad (as well as tourists), the Cuban government announced that from May 2010 onwards, visitors to the country must purchase health insurance from one of several domestic authorized agencies (“Detallan costos” 2010; “Cuba exigirá” 2010). As a rationale for the insurance requirement, the government alleges, probably correctly, that some visitors were taking advantage of Cuba’s free health care system. The cost of the insurance is $46 to $48 per month, for a maximum annual coverage of $7,000 (Chardy 2010). With more than 2 million visitors a year, the mandatory medical insurance should bring in more than $90 million annually, some $14 million from the émigré community. Even though the precise amount paid in fees by the émigré community to the Cuban Consulate in Washington (and in Havana) for travel-related (and other) services cannot be precisely estimated, it is certain to be in the tens of millions of dollars (perhaps in the $60–$80 million annual range). Comparable fees are levied by Cuban consulates in other countries, further increasing the financial burden on the émigré community. The wide range of requirements and hefty fees associated with each are evidence of the willingness of the Cuban government to financially squeeze the country’s citizens that, for one reason or another, left the country for good. As noted, these onerous consular practices are consistent with the requirement to convert U.S. dollars into CPs at a disadvantageous exchange rate for emigrants of limited means. The same applies to the unwarranted taxes levied on consumer goods imported into the country when alleged to exceed maximum requirements. These punitive charges represent an extension, beyond Cuba’s confines, of the confiscatory practices implemented domestically as emigrants are dispossessed of material possessions upon leaving Cuba. Contrary to other countries’ practices that maintain consular fees low to serve poor compatriots abroad, the Cuban government regards emigrants as a font of revenue to be exploited at every opportunity. The practices of the Cuban government to charge emigrants excessive fees for routine consular services as well as for services not required by any other nation, together with many other abusive policies implemented over the years—as described by Ojito (2005), among others—help explain the sharp dichotomy alluded to by Jorge Domínguez in a recent Havana seminar paper. A 2007 Florida International University (FIU) Cuba poll found, Domínguez notes, that while only 43% of emigrants who left the country between 1959 and 1964 were in favor of a national dialogue among Cubans, almost 80% of those emigrating between 1995 and 2007 were in favor. In contrast, nearly equal percentages in both groups (74% and 72%, respectively) supported military action by exiles to replace the Castro government (Domínguez 2010). The inescapable inference is that a vast majority of Diaspora Cubans, regardless of when they left the country, are frustrated with the situation there. The greater willingness of the most recent arrivals to support a national dialogue reflects their concern about the well-being of and desire to remain in contact with and financially support their families. This accounts for their acquiescence to pay the excessive fees charged by Cuba’s government. Finally, the abusive treatment to which Cuban émigrés are subjected in the form of extensive requirements and high fees calls into mind whether consular fees should be seen as a sovereign issue or a matter that ought to be regulated through international agreements. Such agreements could prevent abuses while promoting equitable and reciprocal treatment of émigrés regardless of source country. 1. I am grateful to Mario González-Corzo and Jorge Pérez-López for their valuable comments and suggestions on an earlier draft of this paper and to Ricardo Puerta for bibliographical references. 2. Visitors to the island—whether of Cuban or of any other national origin—as well as Cuban visitors traveling abroad, must pay airport fees (currently 25 CP). Airport fees are used quite extensively around the world to finance construction and operation of international airports and therefore are not considered in the rest of this note.